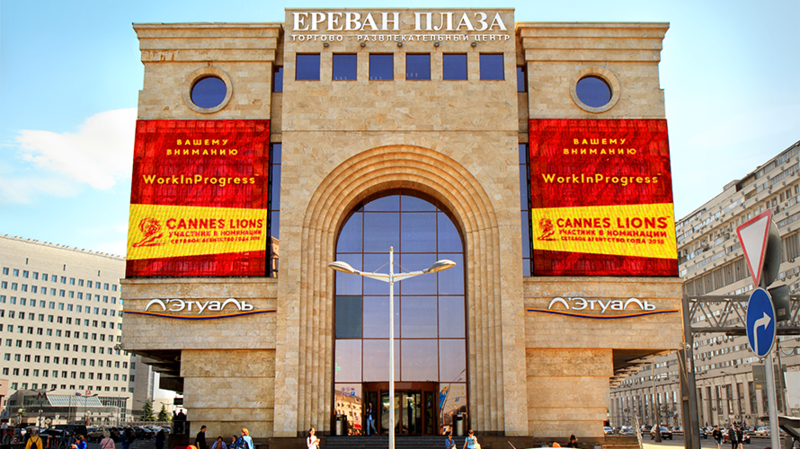 The agency took over Yerevan Plaza in Moscow. WorkInProgress (WIP) is not exactly the most qualified candidate to win Agency Network of the Year at the Cannes International Festival of Creativity. WIP is not an agency network at all, but rather a single agency opened in 2016 by veterans of CP+B’s Domino’s team. Technically, however, since Agency Network of the Year goes to the agency that wins the most Cannes Lions across all categories, they do qualify for the honor. So where would an under-qualified candidate turn to to win such a distinction over higher profile candidates? Russia, of course. WIP launched an out-of-home campaign in the country calling for a little help hacking the Cannes Lions category. To bring the campaign to life, WIP worked with a media company in Russia to get “a lot of Russian eyeballs” on the billboard, settling on crowded Erevan Plaza in Moscow. The signs were designed to attract eyeballs in the city via their bold red and yellow color scheme, a throwback to the Soviet era. The agency did run into some difficulties navigating the country’s advertising guidelines. While the tongue-in-cheek ad, which the agency clarified is not intended to actually ask anyone to hack the Cannes Lions category, is unlikely to result in WIP winning Agency Network of the Year, it could certainly generate some attention for the agency. WIP is no stranger to such attention-grabbing OOH ads, having created the “Contextual Ruins” billboards promoting Adam Ruins Everything for truTV and the “world’s most remote pop-up shop” for 37.5 Technology.